• Learn to embrace color with confidence in three easy steps by playing with patterns, textures and hues for eye-catching results. • See how one woman fused her husband’s Moroccan heritage with her West Coast roots for a Palm Springs home that’s a melting pot of bright colors, striking patterns and infinite warmth. • Go mobile by investing in a rolling cart and see how its functional versatility can boost service and style in room. 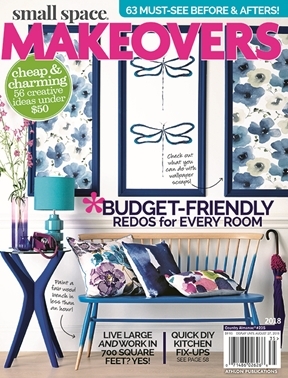 • If you’re a renter, check out our 12 go-to tips for an enviable facelift that won’t blow your budget—or cost you your deposit. Plus, discover how to add character to your decor with mudcloth fabric; refresh your kitchen with 15 instant updates and transform a blah patio into an outdoor oasis in an afternoon.